Seiji Igusa is an acoustic guitarist/ composer in Japan. He was born on November 9, 1988 and got close to a hymn and gospel from the childhood period. He began playing the piano at the age of 4 and playing the drum at the age of 11. He started playing an acoustic guitar at the age of 15 and is affected by guitarists such as Martin Taylor,Doyle Dykes. He won the second prize of "Fingerpicking contest" that was held in Osaka in December, 2006. In July, 2007, he got a grand prize of SonyMusic audition called "Tobi-labo" in Osaka. Then, In August, 2007, I won the second prize of SonyMusic audition called "Tobi-labo" in Tokyo. In April, 2009, he participated in national convention of the acoustic guitar, "FINGER PICKING DAY 2009". He won a grand prize and a prize for original arrangement at that convention. In October, 2009, he played as an opening act in "Tommy Emanuel JAPAN TOUR". In November, 2009, he released his first album "Introduction". This CD made his debut as a professional and he started music activities in many areas. He participate in global guitar contest held in U.S. Kansas in September, 2010, "39th Walnut Valley Festival". He participated in "International Fingerstyle Guitar Championship" as a representative from Japan and was chosen as Top5. 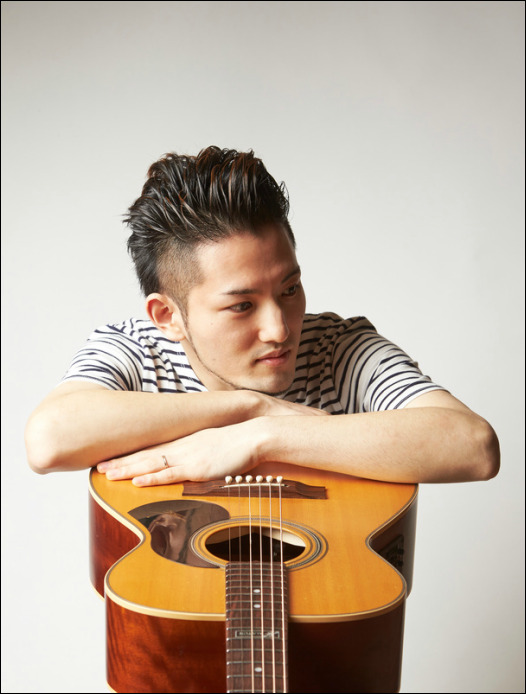 In October, 2010, did an opening act for "JOE ROBINSON JAPAN TOUR"
In April, 2012, he released his 2nd album "kokoro". In February, 2013, he moved the headquarters in Tokyo from Osaka and have begun to appear to TV program and a radio. In March, 2013, he also began working on guitar duo "SOULGAUGE". They adopt a taste of "R & B" into "finger-style" and become the topic in the music scene of Japan. In July, 2015, he released his 3rd album "Welcome Home". "Light Waves" of this album becomes the ranking first place in video sharing site of Japan and becomes the topic mainly on the internet.